Scotty Hinds (Nine High, Smash Brothers) is a driving force when he gets into the studio. He has an uncanny ability to just get busy on any beat and make it sound dope. He was raised around dancehalls as a youth in Reading, UK and the riddims have stuck with him throughout his whole life. Influenced by an eclectic mixture of music ranging from Hip Hop, Soca/Dancehall, Garage, Grime, Dub Steb & Bassline. 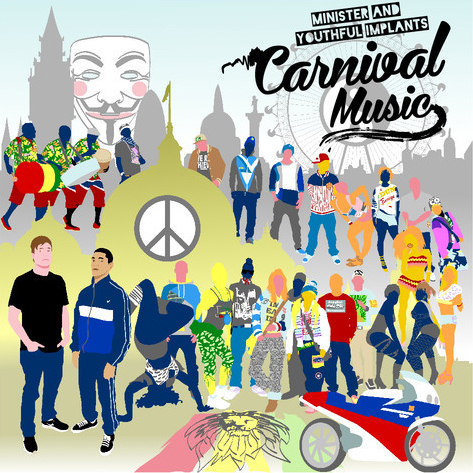 When Scotty links up with producers outside of the ‘Hip Hop & Grime’ realms, he takes on the moniker of Minister and always delivers something special… Here we see him link up with fellow UK expat & producer Youthful Implants to create a mash up of music containing all elements of the above mentioned influences which they have aptly titled Carnival Music not only to name the EP, but also the genre, because this is in a whole new lane of it’s. This digital EP (5 songs + Instrumentals) is out now.